The producers of Amazon’s new series, “Point of Honor,” set out to appeal to mainstream viewers who for whatever reason prefer their dramas to be set in the past. The history itself is almost incidental. “Point of Honor” plays with the time tested popular meme of the family caught in the middle of an unfolding national tragedy. Imagine the cast of “Dynasty” in 1861. At the center of this national tragedy is the Rhodes family of Lynchburg, Virginia. There is young John Rhodes, who is off at West Point, along with his sisters, Estella and Kate. 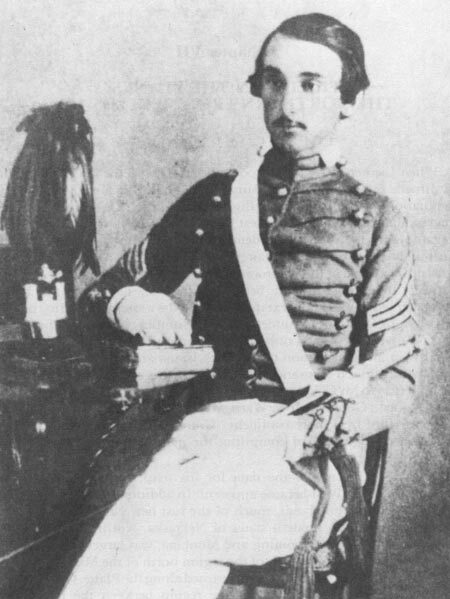 The third sister, Lorelei, is married to the dashing Robert Sumner, who is also at West Point and from the North. Finally, we have the patriarch of the family Ralston Rhodes. It doesn’t take a rocket scientist to predict where this is going. The central focus of this pilot episode is to get the Rhodes family right on the issue of slavery. In an early scene set in the West Point chapel John Rhodes addresses his fellow cadets after hearing of the firing on Fort Sumter. The young cadet denounces the institution of slavery and pledges to free his family’s slaves, but commits to fighting for Virginia and the Confederacy. With that he walks out, along with his fellow cadets from the Deep South – apparently unaware that their states seceded months earlier. A few moments later Robert Sumner confronts his brother-in-law demanding to know how he can denounce slavery, but still fight for the Confederacy: “Read the Confederate Constitution. This war is all about slavery.” John fires back that, “They write in ink. We write in blood.” And with that John establishes his good character by committing himself to remain untouched by the evils of slavery. Before departing John reminds Robert that through his marriage to Lorelia he will always be welcome unless that arrival is accompanied by invading Yankees. In that case Robert will be dealt with as such. The producers of this show know that in order for their audience to empathize with the Rhodes family they must first establish sufficient distance between the family and the Confederacy. It is tempting to see this as an attempt to preserve the Lost Cause interpretation of the war, but, in fact, it constitutes its abandonment. “Point of Honor” makes no attempt to sugar coat the institution of slavery nor does it attempt to portray the family’s slaves as loyal – both of which are crucial elements of the Lost Cause narrative. This, however, is not just an anti-Lost Cause film. The show also unintentionally establishes itself as an ant-Confederate film by intentionally referencing slavery in its constitution. At no point in the pilot episode does John or anyone else in the family closely identify with the Confederacy. What is truly bizarre is the show’s commitment to distancing the family from slavery. “Point of Honor” reinforces this theme by depicting fellow white Southerners in Lynchburg as pro-slavery. After arriving home and convincing his sisters that emancipation is the morally correct thing to do, John gathers the slaves and in dramatic form announces that they are free. The slaves burst into “Amazing Grace” while the Rhodes family looks on with pride and invites the slaves to stay on their land and work for wages. Not everyone in town is pleased with the family’s decision. At one point a mob of poor whites, led by the mayor of Lynchburg demands to know if it is true that the Rhodes slaves have been freed. The home is defended by the three gun-wheeling sisters until John rides up in full Confederate uniform. The family is beset by threats from outside of the state and even from within their own community. There are many unanswered questions that complicate the story further. Why does John Rhodes wait until a war to free the family’s slaves and what were the circumstances that led to the decision to give the eldest son this responsibility? There is one final element that will likely go far in future episodes to maintaining the moral high ground for the Rhodes family and that is the portrayal of the Union army. At West Point the cadets are commanded by a Colonel Palmer Kane, who from the beginning is portrayed as a loyal soldier with strong feelings for the Union, but also harbors a sadistic streak. In a conversation with Robert Sumner concerning the kind of war that ought to be fought Kane waxes poetic on the amount of- and nature of the destruction that ought to be brought to bear on the South, not simply as a necessary war policy, but as revenge for disunion. By the end of the episode somehow Col. Kane and Sumner end up positioned poised to strike the family farm outside of Lynchburg. In the final action scene the Rhodes brothers, along with their father end up skirmishing with Kane’s men. At one point the colonel shoots a Union soldier at point blank range for running away from the fighting. By the end of the skirmish John’s father also falls fatally wounded from his horse. Watch the pilot episode for free. It also buries women’s clothing history. NOBODY DRESSED LIKE THAT. I will likely write another post about how the women are portrayed if I can muster the energy. Oh, but those boobies bring in the ratings, doncha know? I’ve only seen the trailer but whoever dressed like that, especially, after the, um, servants were, er, released? If a person in 1861 believed that this war should be fought over something as esoteric as a “point of honor,” and that this is a sufficient reason to destroy hundreds of thousands of American lives, create thousands of grieving widows and orphans, produce hundreds of thousands of sickened and maimed veterans, then they are much worse person to me than anyone who defended slavery. At least, you can understand why someone might think that this war was justified to defend an institution so central to their society. Which is why I suggested that this series isn’t really about the Civil War era. The history is incidental to the roles that each character plays and the challenges they confront. You could just as well situate this story in the Revolution, which is pretty much Mel Gibson’s “The Patriot”. “Why does John Rhodes wait until a war to free the family’s slaves?” That is the biggest question I have. Something tells me it will remain unanswered. I am also concerned with the fact that the vilification of the Union Army is necessary to create sympathy for the show’s protagonists. The series may be bypassing the Lost Cause mythos, but perhaps the peculiar way in which it depicts its characters is similarly damaging? The vilification of the Union army, of course, is part of the Lost Cause narrative made popular in Gone With the Wind, but you see it in more recent movies like Dances With Wolves. Gary Gallagher talks about this depiction in his book, Causes Won, Lost, and Forgotten. I am very happy to see that they do stress that secession was about preserving slavery. As for the freeing of his slaves, however, maybe there is something big going on here in the theme of the series that will be developed as it goes on and the characters and storylines get fleshed out. Perhaps, for example, he knows what his old man has been up to, and thus that there are slaves on his plantation that are actually is half brothers and sisters. Perhaps he himself has a mother from among the slaves. Now wouldn’t that make for some juicy tv!? Obviously that would not be something he would be readily willing to reveal. Just speculating. On another note, I hate to hear that the Yankees are going to be portrayed as vile, sadistic, and wanton destructors. Isn’t this getting old by now? But of course it seems needed to justify this guy’s siding with the South despite his sentiments on slavery. Not that I could sit through it again, but I keep thinking about Spielberg’s failed pilot for “Class of ’61” (1993), also set at West Point and also featuring an antislavery southern hero who decides to free slaves right before Fort Sumter. Now that’s one slipped by. Thanks, Ken. While I agree that the show “buries” the central tenet of the Lost Cause–that the war wasn’t about slavery–it borrows freely from other aspects of the myth and endorses them. John Rhodes is just the mythical Robert E. Lee writ small: defending his homeland out of a sense of pride and fear of Yankee brutality, rather than any loyalty to the Confederacy or support for slavery. Kane too is just the mythical Sherman, chomping at the bit to ravage the South and punish it (read: March to the Sea and Reconstruction) for daring to defy the all-powerful federal government. My impression was that it didn’t so much bury the Lost Cause as shake a little dirt on it. Good points, but I think the Lost Cause leaves plenty of room for Lee’s identification with the Confederacy. I’ve always seen the problem of slavery as central to the Lost Cause. Without it the rest loses its punch. I think the other stuff matters because they still undermine and vilify the northern war effort, which was the Lost Cause’s initial goal. The evil vindictive northerner and the defensive noble southerner is basically the root of the whole “War of Northern Aggression” trope. If you characterize the combatants that way, then it’s easier to argue that Reconstruction was unjustified. All good points. I don’t disagree. I no doubt overstated my case, but what I was trying to stress was that the show makes no attempt to portray loyal slaves or downplay the evils of slavery. If anything the attempt to create a moral high ground for a Southern/Confederate slaveowning family creates a huge mess. You’ll get no argument from me about the “mess” and we’re mostly on the same page. Indeed, I think the show’s honesty about the Confederate government’s commitment to slavery is its primary contribution. Indeed, I think the show’s honesty about the Confederate government’s commitment to slavery is its primary contribution. Yes, but it comes at a huge cost. Kaci, I am with you on the “Lost Cause” vilification of US soldiers and by extension the US cause in the war. That burns me almost as much as the defense of slavery and their misrepresentation of the rebel cause. The US Army wasn’t full of cowards, brigands or “heathen barbarian” mercenaries in the war. They were Americans, let’s remember them as such. That’s not to say weren’t elements of such in the US Army (same goes for the confederate army) but by and large the men in the ranks were there to put down a rebellion against lawful authority and generally conducted themselves in a manner in which a grateful nation could be proud of. Also, they need to read up on the uniform regulations at West Point during that era. Facial hair wasn’t allowed. Sheridan was supposed to graduate with the 1852 class (the other two men in the photograph were Class of 1852) but he was suspended for a year for fighting with another cadet. The previous day, Sheridan had threatened to run the classmate through with a bayonet in reaction to a perceived insult on the parade ground. He graduated in 1853, 34th in his class of 52. Yet is this a matter of the “Lost Cause” or what I’ve noticed in MOST films about the US military during the past 40+ years? The military is routinely portrayed negatively with some exceptions. The same goes for the government, corporations, religious institutions, etc. May I correct one reference many made. It was not the Union Army….it was the United States Army…the exact same Army we have today. Exactly, that’s why as a veteran of that esteemed institution it galls me to see it repeatedly slandered by adherents of the Lost Cause. Ok, so it IS fiction then. I was confused as to whether that was the case or not when I read your first post about this show. I guess I’ll still have to watch it eventually, although I’m a little disappointed that it’s not a least “based on a true story”. In reading the autobiography of John S. Wise (portrayed in “Field of Lost Shoes”), I found a complicated person with an interesting story to tell, so was hoping that was the case here too. Ah well. Interesting — “Point of Honor” is the name of a famous antebellum home in Lynchburg, although it otherwise has no relation to the plot of the story. As the movie goes, I thought it was pretty well acted and that the scenes were beautifully filmed. It’s also exciting for us Civil War buffs to have a new source for us to enjoy. It is after all a fictional account and not intended to be historical. Along with the “why does the rebel protagonist wait until the war begins to free the slaves” I would ask “how does the rebel protagonist do this when, presumably, the slaves actually belong to the rebel protagonist’s rebel father”? Along with, why doesn’t the rebel protagonist own a razor? Mustaches, small and neat, I can accept, but the beard and whiskers combo in the photo looks like an extra from Miami Vice. Well, I got around to watching this mess and now that I’ve seen it I have five thoughts. 1) The freeing of the slaves nonsense is clearly something that they are setting up as a mystery to be solved as the series progresses. In one scene the daughters ponder why their father would go along with this decision of their brother’s, and one says “I dunno, something has happened,” and then it is left at that. Cleary the reasons for the emancipation will be developed later. Of course, no matter how it turns out, it still doesn’t change the fact (as you point out) that the writers obviously did this so that the heroes of the show are not slaveholders. The same thing was done in the film The Patriot, but here it seems even more ridiculous, if that is possible. It confuses me why they think that audiences need a noble protagonist on the right side of slavery. In the age of such shows as The Sopranos, Breaking Bad, and The Walking Dead, its clear that audiences can handle complexity in their protagonists. 2) The number of cliches in this thing is mind numbing. Besides those already mentioned here and other places, one that I found most annoying is when one of the daughters discusses how the Rebel army will be made up of farm boys that are accustomed to hunting and shooting, but that the U.S. army will be made up of textile workers, and thus “we will slaughter them by the wagonloads.” Now, it is true that a southerner would make an inaccurate boast like that, but for the uneducated viewer the statement will just affirm what many believe to be true about the differences between southern and northern soldiers. We know that the vast majority of Yankees were farm boys too, but most people don’t know it, and a line like that in the show only perpetuates a myth. 3) The scene where the slaves discuss running away to the North (before they learn they have been freed) rings true, although it would have been more accurate to have had them talking about just making it to Union armies. In my research I found that slaves in Virginia were indeed having conversations like this even before any Union soldiers had set foot in the state and they anticipated that freedom would arrive with the Yankees. 4) It appears that the women will be very strong characters that will bear the burden of taking care of the plantation and its finances. If done correctly, this could be a very positive and accurate aspect of the show, but given what we have seen so far I am not sure we can trust the writers to handle it well. 5) The only other redeeming thing I found about the show (other than the attractiveness of the sisters!) is the beautiful shots of the Westover Plantation on the James River (although the show is set in Lynchburg). It was the home of the famous William Byrd II (Yes, the one with that incredible and saucy diary), and while the grounds are open to the public, the interior is not (unlike the other beautiful plantation homes near it). Watching this episode finally gave me some glimpses inside the home (built in the 1730s) and I found that fascinating. Thanks one and all for taking one for the team and reviewing “Point of Honor”. I like the way you phrased that, Jerry. This show is just the newest way that the “lost cause” is trying to infiltrate a new generation. The LC has for quite a while been pushing the lie that slavery had nothing to do with the Civil War and this show is all about that. Nothing about slavery, it was all about defending their “states rights!’ and their homes from those terrible Yankees! Don’t be surprise it some of the freed slaves join the “hero’s” regiment to defend the South they all love. Excuse me folks, I think I need ten stiff drinks right about now.